The RV park and campgrounds are below. If you know of any Mississippi RV facilities not listed here, please submit them and we will get them listed in the MS directory. We offer primitive camping, or hook up your RV to our full service camp sites. Level, full hook up sites with concrete patios. 27 pull thru sites, 49 total sites 30/50 amp service We can accommodate tents to large rigs in our campground. In a beautiful wooded area just outside of Tupelo, MS, one block from over 30 restaurants and The Mall at Barnes Crossing, the largest mall in North Mississippi with over 100 stores. Great for large towable trailers and motor homes. Roys location is in Chatham, Mississippi, which is to be found on the north end of the lake. Location #2 is on the south end of the lake in Glen Allen, Mississippi. Both places are on the banks of Lake Washington - right in the heart of the Delta. 65' Sites each with 10'x40' level concrete pads for motorhomes and trailers. Our Fair City has many things to offer from great southern food to the Choctaw Indian culture. Mississippi has beautiful scenery and plentiful hunting and fishing. Enjoy camping in quiet, shady pull-through sites nestled in a peaceful country setting. 9 full service hook-ups with wireless internet available at all slots. We also have a centrally located Bathhouse with showers open 24/7. Just south of Jackson in Byram, MS. You'll find we have everything to offer the camping enthusiast. Good Sam, AAA, AARP, Military and Escapee discounts accepted. You'll enjoy the many points of interest along the six block long shady paved trail. From there you'll enter our Earth Science Museum. 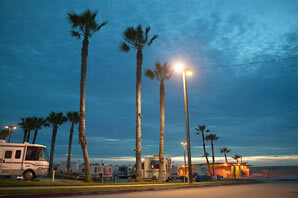 Bay Marina features both wet and dry boat slips, full hookup R.V. spaces, lovely apartments and all the amenities you should expect from a first class boating and recreational facility. Cajun RV Park boasts sites featuring full hook-ups with all the bells and whistles for the smallest to largest rigs. A private, membership only rv facility, among the beautiful pines overlooking the crystal clear spring-fed lake which is excellent for fishing and swimming and perfect for motor homes and trailers. Our park is family owned and operated. All rv sites have full hookups with 30 & 50 amp service & free wireless internet. All sites are satellite friendly. New bathhouse & laundry. All sizes of motor homes and trailers are welcome. We have many rental options to choose from. Weekenders, overnighters, month to month, cabin rentals and water front access. We offer free DirecTV satellite connection for every lot as well as free wifi access courtesy of TangoInternet. Bay Berry is a new RV park located on the beautiful Mississippi Gulf Coast! It's the perfect spot to stay when you're looking to explore all that the Gulf Coast has to offer. Between beautiful Fort Bayou and the natural splendor of a tranquil oak and pine forest. TLC Wolf River Resort is a campground that offers premium camping at a competitive price. We are located in Pass Christian, MS, just 3 miles from a beautiful 26 mile stretch of sugar white sand beaches. Whether relaxing under the whispering pines, or enjoying the many amenities we offer, we hope your stay with us is a wonderful experience for you and your family in south Mississippi. In a beautiful country setting. RV camping 15 minutes from the casinos and the beaches. Relax on acres of laid-back atmosphere. Quiet, private, large pull-through full service recreational vehicle sites for large motorhomes and travel trailers with 30 / 50 AMP service. Find recreational vehicle camping and rv resorts and parks of Mississippi.